Did you know that by integrating Wufoo with a couple other popular business tools, you can rig together your own lightweight marketing automation system? It’s pretty great, especially since you can use the tools you’re already using and love! Before I get into the how, let’s just do a quick refresher on what marketing automation is, for those that might not yet be familiar. Marketing automation is software technology that allows marketers to automate many of the most time-consuming tasks such as collecting lead info, sending email, and inputting data into your CRM. Probably the most common use of marketing automation is segmentation and sending email. Another common use is to bridge the gap between marketing and sales, providing end-to-end tracking down the funnel. While there are additional ways to use marketing automation, the two I noted above provide a great place to start. Just these two uses can save you a whole lot of time while helping you nurture more leads into qualified prospects. Let’s look at how you can use Wufoo, along with a few complementary software solutions, to achieve those great benefits at a fraction of the cost as having a dedicated marketing automation platform. Whether it’s for email or sales force automation, Wufoo is where it all starts. As a data collection tool, your Wufoo form is the first step in the automation process. Once a form submission is collected, you can use one of our popular integrations, or Zapier, to begin sending that data to other tools to carry on the workflows. Here’s a simple example of how we’ve seen this play out. Let’s say that you have a ‘Contact Us’ form embedded on your website. Once someone fills out this form, you can automatically send this data over to your favorite email tool, such as MailChimp, so that you can trigger a confirmation email letting the person know that you’ve received their request and will be following up shortly. Simultaneously, because you also want this new lead to be added into your CRM, you send this Wufoo form data straight to your CRM system (e.g. Salesforce). Any lead distribution rules you have in place within your CRM will also get triggered once a new lead is added so that the right rep is notified and can follow up. Pretty simple so far, right? Well, as most of us who work in sales or marketing know, the process isn’t always so linear or easy. Maybe your rep had a good conversation with the prospect, but the prospect isn’t ready to buy, so the sales rep updates the lead status in Salesforce to reflect this. Based on the new lead status (or some other criteria you identify), you can move that person into a nurture list that has a workflow designed to nurture leads who are in a particular stage in the sales cycle. Each email sent then gets logged into Salesforce so that the rep can keep track and follow up again once the nurture campaign is completed. I know, pretty cool! Achieving a lightweight marketing & sales automation workflow doesn’t need to be cumbersome or expensive. Maybe you don’t use MailChimp or Salesforce; no problem. Our good friends at Zapier provide over 1,000 seamless Wufoo integrations so you can connect your Wufoo forms with the tools you use and love. Why should you use Wufoo & friends for your lightweight marketing automation system? 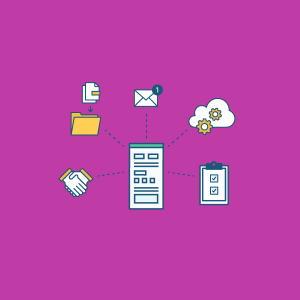 Many small and medium-sized businesses don’t have the resources to justify a complex marketing automation system. On top of that, 3 out of 5 marketing automation implementations fail, which ends up being a costly mistake. However, that doesn’t mean that these businesses can’t benefit from the same time-saving automation. In fact, I would argue that it’s the resource-strapped businesses that need it the most. And now it’s more accessible than ever! You’ll be well on your way to taking back more of your time so you can focus on the bigger picture. And depending on the tools you choose, all of this can cost you less than $100/month compared to the $800+ /month cost of a standalone marketing automation tool. Better yet, you won’t need to worry about learning all-new, clunky software. I would love to know how many of you currently use Wufoo in a similar fashion and/or are interested in learning more about how you can use Wufoo to automate your workflows. If there’s more interest in this, we’ll build out additional content that offers strategies, best practices, and some of our favorite tools to use. Let me know in the comments!